Hi! My name's Peter. Welcome to my website about Buddhism. This site has instructions on how to do zen meditation (called "zazen") and some articles and talks on Buddhism. If you're in or around Tokyo, I hold zen meditation classes on Saturdays at Tokyo University Buddhists Association. Anyone interested is welcome to attend. I'll be holding a Four-day Buddhist Retreat at Shokakuji temple near Tokyo from May 3-6 (Friday to Monday), 2019. Anyone interested is welcome. Practicing zen meditation is a big part of Zen Buddhism. The Japanese word for Zen meditation is "zazen". "Za" means "sit" and "zen" means "meditation". So if you're interested in learning about Zen Buddhism, a good place to start is to try doing zazen. On this page you can download a PDF file with instructions on doing zazen. There's also two videos on there of my Buddhist teacher, Gudo Nishijima, demonstrating how to do zazen and talking about the meaning zazen. There's also answers to four questions I was asked about doing zazen. This page has four talks that my teacher, Gudo Nishijima, gave at a Zazen Retreat at Tokei-in temple in Japan. The Heart Sutra is a popular sutra in Buddhism. It's a very short sutra with only about 300 words, but it's said to contain the essence of what Buddhism is about. This is my translation of the Japanese version of the Heart Sutra, known as "hannya shingyo". There's also a link at the bottom of the page to an audio file of the Heart Sutra being chanted by some Japanese monks. The Buddhist precepts are guidelines for daily life for Buddhists. Many Buddhists try to keep the precepts as best they can on a day to day basis without doing any formal ceremonies. But there's also a ceremony you can do if you like to formally take the precepts. This page has a short booklet about what the precepts are and how they came about. There's also a couple of articles on their about me doing a ceremony to take the precept and about what the precepts are. This is a short article about how I was dumb enough to ask a Buddhist priest about God, and what he told me. I grew up in Ireland, but left after college to spend a few years travelling. I arrived in Japan in 1991. I expected to stay a year, but ended up staying much longer. I began studying Buddhism with Gudo Nishijima in 1996. A few years later I was ordained a Buddhist monk. In 2001 Gudo Nishijima gave me his formal approval to teach Buddhism to others. I taught classes at Gudo Nishijima's Zen center near Tokyo, and later on I started teaching at the Young Buddhists Association at Tokyo University. I work as a translator, and live with my wife and our two children.
? 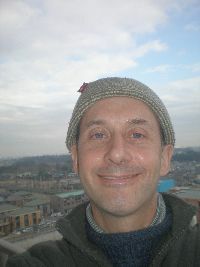 2008 www.zen.ie. All rights reserved.